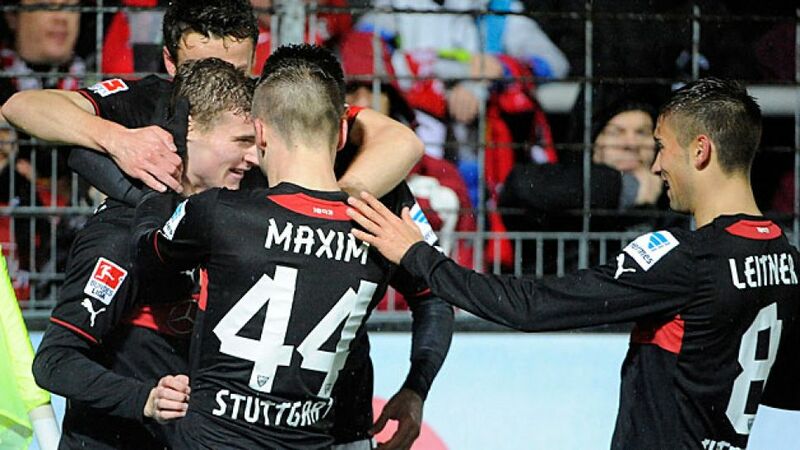 Munich - “For a kid of his age, his composure in front of goal is remarkable,” said VfB Stuttgart head coach Thomas Schneider of teenage sensation Timo Werner after VfB’s 3-1 win at SC Freiburg on Matchday 12. The 17-year-old has exploded onto the scene this season with three goals and two assists in ten appearances for the Swabians. Max Meyer (three goals, one assist in nine matches) has had a similar impact at FC Schalke 04 and, together, the two of them have kept the watching world convinced that Germany's conveyor belt of talent continues to produce players of the highest quality. Werner became Stuttgart's youngest ever debutant when, at the age of 17 years, four months and 25 days, he appeared in a UEFA Europa League qualifier back in August. He did so having been fast-tracked to the senior squad from the club’s youth side via the Under 19s, bypassing the U-18 team altogether. Thomas Schneider was soon convinced by the lad born just a stone's throw from the Mercedes-Benz-Arena, starting him in five of VfB's last eight games, but it was in the local derby with SC Freiburg that Werner’s potential truly became apparent. He twice left defenders trailing in his wake to secure the 3-1 victory, becoming the youngest player and the first Under-18 to net a Bundesliga brace. "Not even I was as cheeky as he is," observed Lothar Matthäus in his role as Sky pundit - high praise indeed from Germany's most-capped player. And Stuttgart aren't the only club to have unearthed a veritable gem. At the season’s outset, the future of Schalke was firmly and almost inextricably linked with Julian Draxler, the club's youngest Bundesliga debutant at the age of 17 years and 117 days and the youngest German player to register in a UEFA Champions League fixture. Now, though, the Royal Blues have another rising star on which to pin their hopes: Meyer. He has had a similar impact to Werner in the colours of Die Knappen this term. The 17-year-old renders Draxler a relative veteran at 20 and has already become the youngest player to score in three consecutive Bundesliga matches, following in the footsteps of VfL Wolfsburg’s Maximilian Arnold (last season) and former 1. FC Köln striker Lukas Podolski in 2003/04. Podolski is one of three German players now plying his trade at Arsenal FC, where manager Arsene Wenger has long been convinced by the quality of player being produced in Germany. “Kids in Germany get given a chance to prove themselves early on,” he explained before the Gunners' clash with Borussia Dortmund in the Champions League last week. This, according to Wenger, is a trend which is set to continue as Bundesliga clubs continue to churn out talented stars. "There are so many young players coming out of Germany," he continued, and the facts would appear to support him. German players make up around 50 per cent of current Bundesliga players, while some of Europe’s top clubs have recruited stars from Germany to improve their ranks such as Chelsea FC (Andre Schürrle), Real Madrid (former VfB midfielder Sami Khedira) and ACF Fiorentina (Mario Gomez). Having provided both Champions League finalists last season, it is clear that German football is currently on the crest of a wave, and with talent like Werner and Meyer emerging each season, the Bundesliga's talent pool is looking sustainable for years to come.